Sweet Potatoes are rich in vitamin A, Vitamin C, Vitamin K, vitamin B8, pantothenic acid, folate, potassium, iron, copper, and manganese. This blend is an ideal, handy starter mash. Everything you need to create a new exciting mash mix every time! ancient grain pasta or other healthy organic ingredients. May also be used on its' own without adding any other ingredients. Superior organic sweet potato powder gives this mix a Vitamin A & B boost! Sold in 300 gram packages. 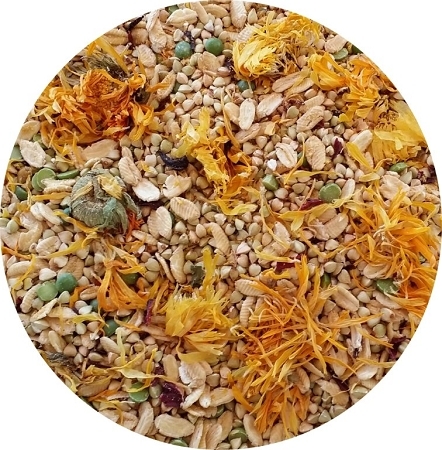 Buckwheat, Kamut® flakes, green peas, sweet potato powder, hibiscus, calendula flowers.